After a couple of good nights rest at the Beez Kneez Hostel in Whitehorse, I continued my journey northward with renewed spirit. 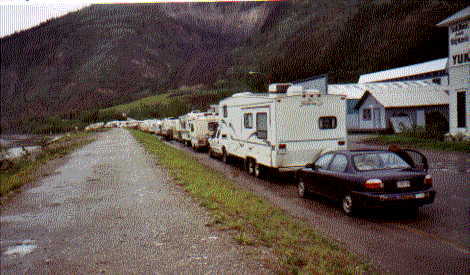 Dawson City was pretty crowded with tourists. Everyone was frantically looking for a vacant room in an expensive hotel. 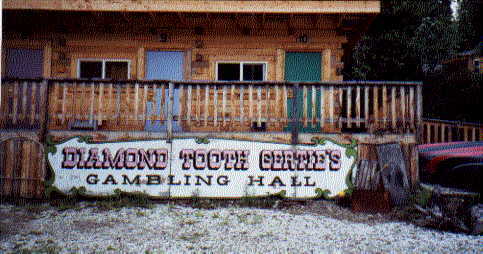 Not me, I just took the ferry across the river to West Dawson City city and went directly to the hostel. No problem there--there was plenty of room. And only $14/night. However, waiting in line for a turn to get onto the little ferry could have taken quite awhile. 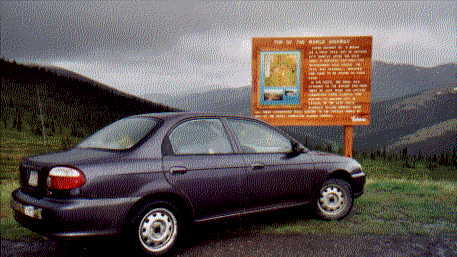 Notice in the picture above--my car is the only car in line, and it's at the end of the line. There were about 12-18 RV's in front of me. 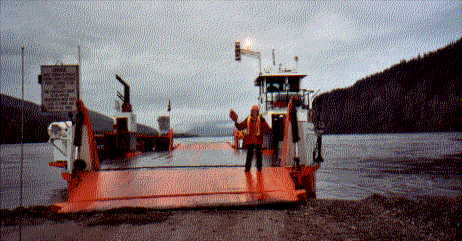 The ferry only carried 3 or 4 at a time. Well, the woman running the ferry walked back to the end of the line looking for a small vehicle to fit into a small space. And I was it. No waiting in line at all. She told me to come up to the front of the line, and she said, "See, sometimes it pays to be small." Left: There's the ferry that crosses the Yukon River. It's the only way to cross, no bridges--heck there's only one road! 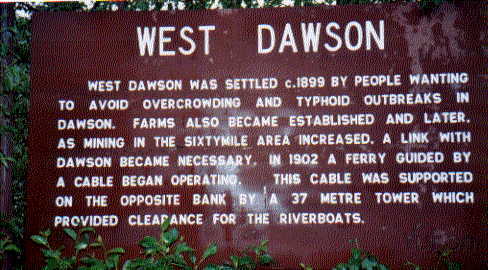 Right: Information on West Dawson, and the ferry. Right: The Hostel also had plenty of room for tents. 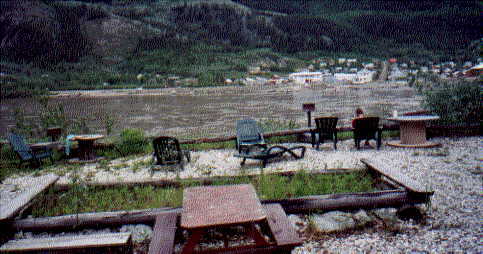 Left: The hostel is located right on the peaceful bank of the Yukon River overlooking tourist ridden Dawson City on the other side. 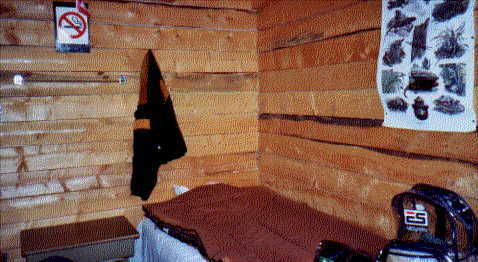 Right: This is one of the woman's cabins. Bottom: This was my bed. Place was neat, clean and had plenty of room. My dorm mates were two woman from Japan, and a woman from the Netherlands. 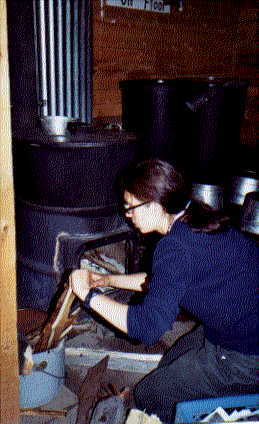 Right: If you wanted to take a bath (no shower), you had to chop your own wood and stoke the fire to heat the water. 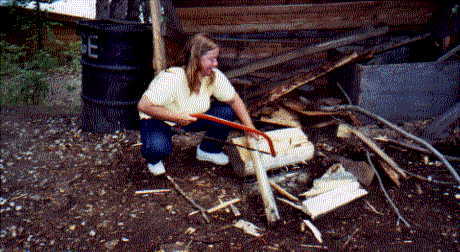 Right: Me cutting wood. Well, pretending to cut wood. Was just posing for the picture. 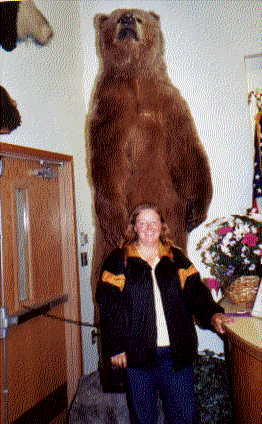 I was waiting until I got to the next hostel, Grandma Shirley's in Fairbanks--I read that she had a great shower there. 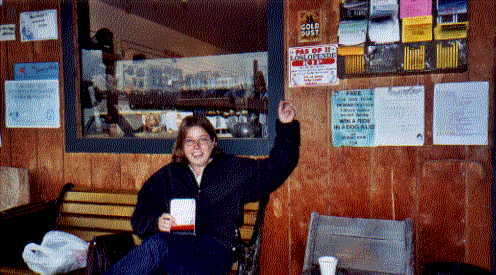 Left: The manager at the Dawson City River Hostel. He had the outgoing, robust personality that you would expect. He loved his job and it showed through his enthusiasm. After leaving Dawson City, I opted to take the "Top of the World Highway". It's not really a "highway". Well, neither is the Alaska Hwy. The "Top of the World Highway is "even less of a highway..." But high above the treeline it meanders through scenery like you wouldn't believe. "The Top of the World Highway"
Left: Me throwing snow. Look at the height of that ridge of snow beside the road. I'm 5'3", so that snow much be about 12' high. Linda, the woman from the Netherlands took the picture. I met her at the Dawson Hostel. She was backpacking around Canada. When I told her that I want to cross the Arctic Circle and drive all the way to Deadhorse, she asked if she could come along. I said, OK. It might be fun traveling with someone else for a change. Above: It had been raining hard most of the day. 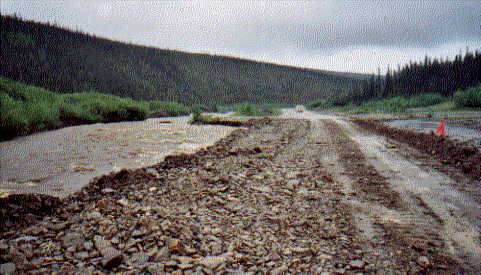 There were many places where the road was almost washed out. 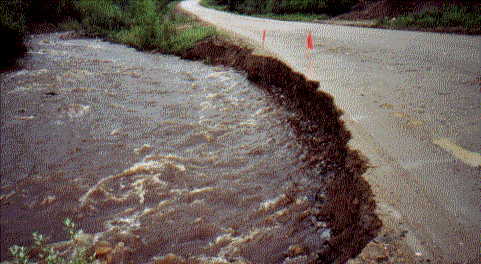 Right & Below: Here are some more bad washouts. The bulldozer here was trying it's best of prevent this one from totoally washing away the road. We made it across. 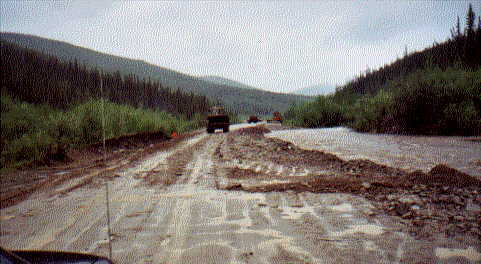 It was important to try to prevent total washouts because this was the only road in and out. 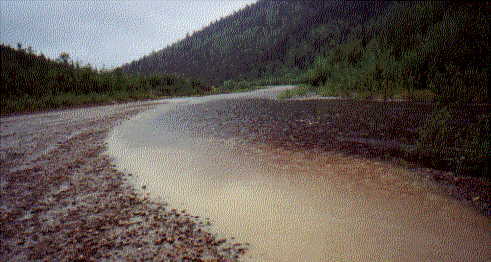 If it washes out, there'd be some people stranded pretty much out there in the wilderness. The prospect of getting stranded out there didn't bother me at all. I wouldn't mind hiking in off the road and setting up my tent. Been there, done that, I'm proud to say--considering my cousin considers me to be somewhat of a "city slicker". Guess she doesn't really know me. 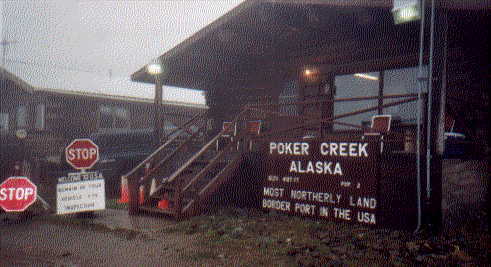 Most northerly land border in the USA. Welcome to the USA: Remain in your Vehicle for Inspection. Of course I had to jump out to take this picture, so I got yelled at . The place is so isolated--you'd think they'd be happy to see someone--anyone. 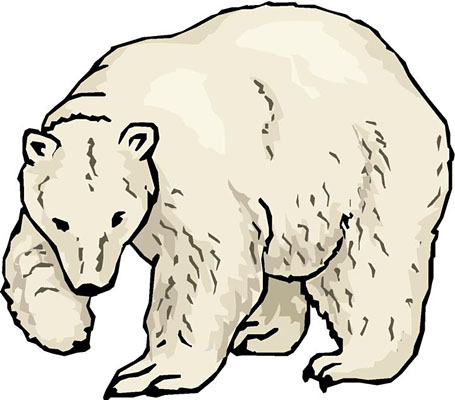 But I guess they have to be cautious--they never know who might be trying to sneak over the border that far north. Finally made it to Alaska!!! 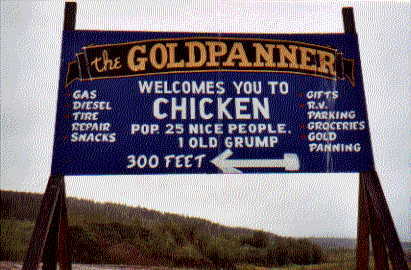 The "GOLDPANNER" was the "hub' of Chicken, Alaska. 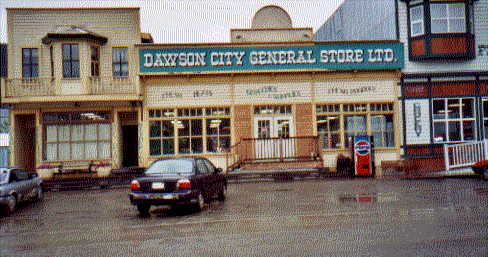 It was the general store. Served good, hot coffee. I bought T-shirts, sweat shirts, & post cards for everyone back home. 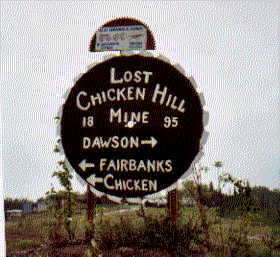 Left: Linda pointing to the "Chicken Warning Sign". The warning was written in Dutch, so Linda read it to me. She asked the store owner why it was written in Dutch, and the wife explained that she was born in Holland. 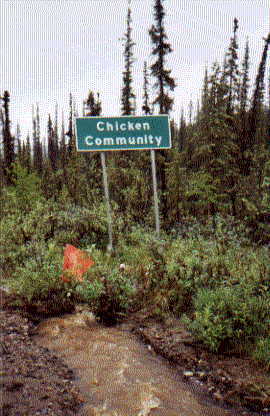 Several years ago she took a vacation, and ended up in Chicken, Alaska where she met her husband, and has lived there ever since. 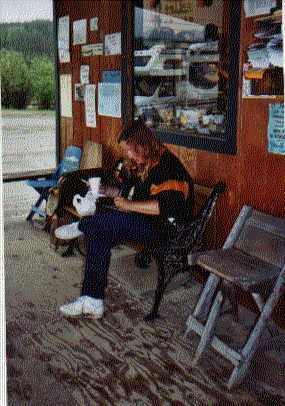 Right: Me drinking coffee, smoking a cigarette (have since quit), and filling out those 'ever present' post cards. If you look closely--you can see the river there beside the building. It has overflowed it's banks. It wouldn't be long before the bridge got washed out--again, the ONLY bridge! It rained & rained that day. We got out of Chicken and off the "Top of the World Hwy" just in time. We later heard that the road was no longer passable. Above: Drove through this one slowly. 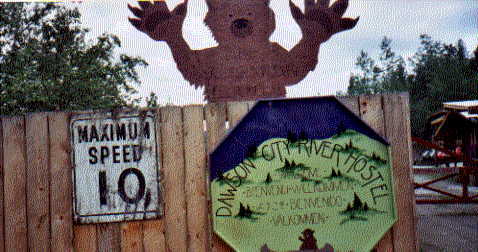 Wouldn't want to run into him while camping or while sleeping in my car! 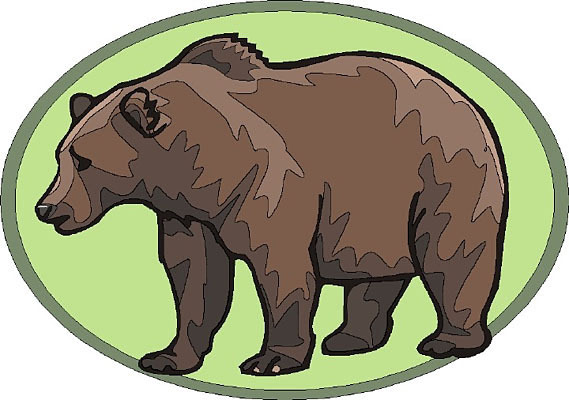 A grizzly like that could just flip my Kia over in a second. 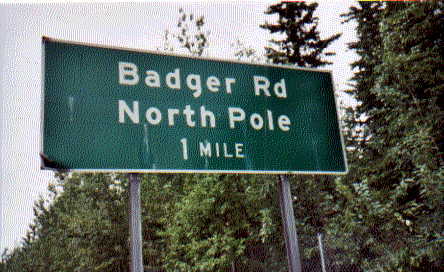 Above: Drove through the town of "North Pole" on the way to Grandma Shirley's Hostel in Fairbanks. I wanted to stop to pick up some post cards, and mail them from the North Pole Post office to some children I know, but Linda wanted to drive straight though. 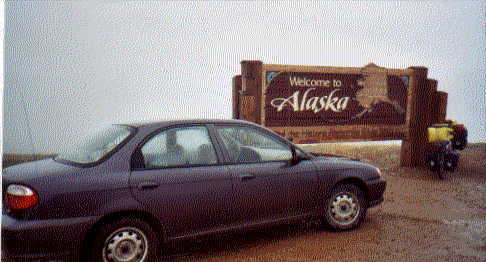 So I drove her to the Fairbanks Hostel, then I drove 20 miles back to "North Pole" to buy the post cards.